Ever heard of the Polar Bear Plunge? Well, in Ukraine they celebrate this event on a whole new level. 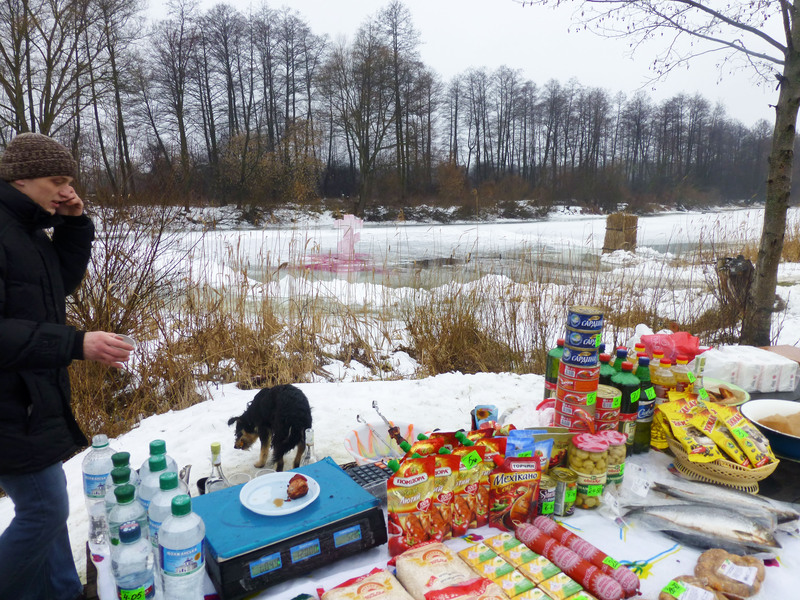 Its called водокрещение (Vodokreschenie) and is celebrated every January 19th as an Christian Orthodox holiday. The event commemorates the baptism of Jesus Christ by John the Baptist on the Jordan river. As a result, the most important ritual of this holiday is the blessing of water which is brought to priests in bottles of all shapes and sizes that many Ukrainians keep for years to repel evil forces in their homes. In addition, it is believed that this blessed water has healing powers and therefore many ceremonies take place on local rivers or lakes into which one can safely jump. The only catch is that most rivers and lakes are iced over at this time of year. If the dip is done correctly, honestly and fully, 3 times, you can expect health and happiness for the rest of the year. Of course, there is a Shashleek BBQ on the side. Our friend Vova, his cousin and good friend. I prepared to experience Vodakreshenya to its full extent this year, despite dubious warnings. However, when we arrived at the river and I realized the majority of my experience would involve a wine and shashleek after party during which I would be standing outside in the sub zero temperatures for an unknown amount of time with long wet hair, I eagerly volunteered to photograph the event instead of participate. My sitemate, Garrett, wasn’t as easily disuaded as me and even decided the experience might remind him of his Alaskan motherland. You can see how a traditional Greek Orthodox family celebrates the holiday in Tarpon Springs, Florida HERE. 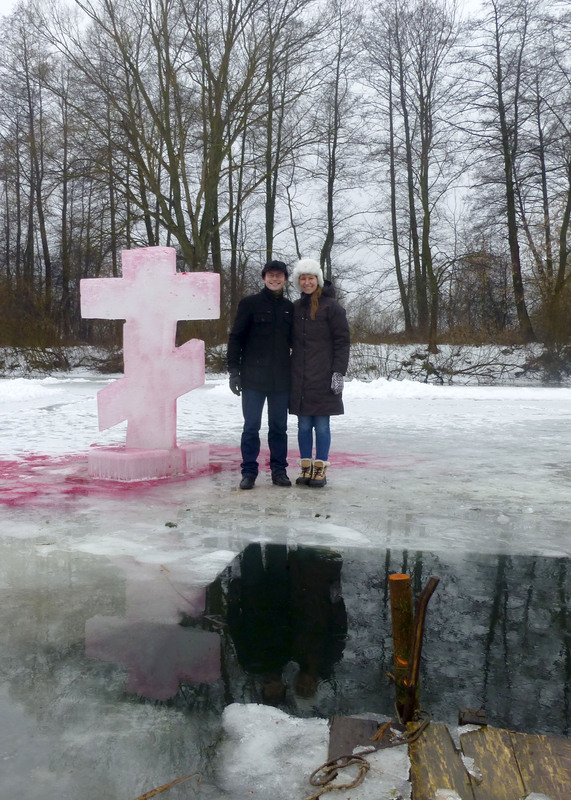 I’m shivering just reading about Epiphany celebrations in the Ukraine!! Let me just say that I’m glad you got to be the photographer for the day! PS Beth comes home next week. Wow, the Polar Bear Plunge is different here. They run into the cold water and the run back into a warm house. 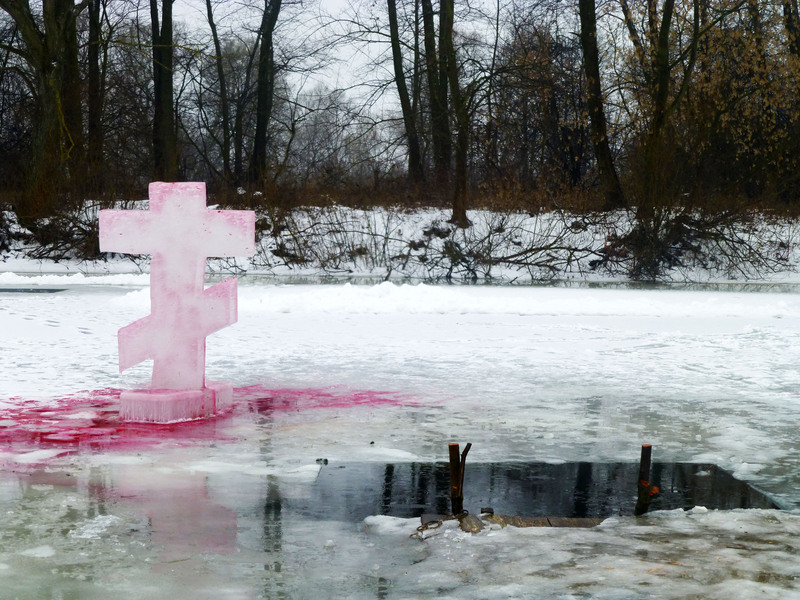 For a minute there I thought that the object on the ice had blood on it until I read further. Other cultures are so interesting! Stay warm !